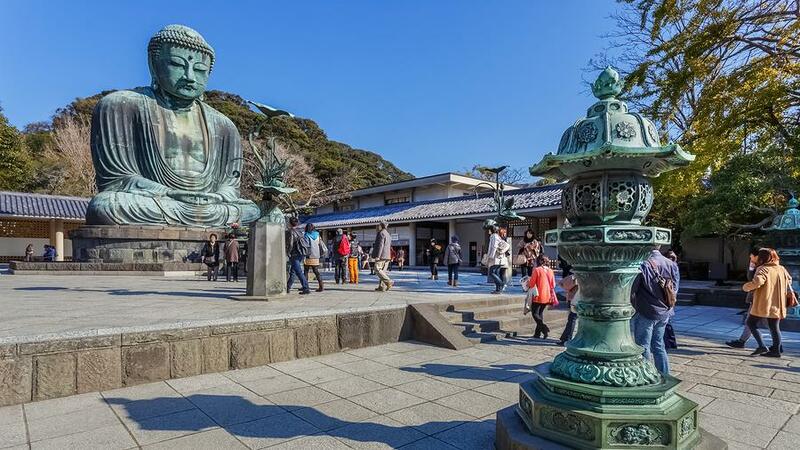 Located in Kamakura in the Kanagawa Prefecture, Kamakura Daibutsu, most popularly known as the Great Buddha of Kamakura, is a monumental bronze statue situated at the Kōtoku-in Temple. An outdoor statue, the Great Buddha is a bronze cast statue of Amitābha Buddha and is said to date back to 1252. Measuring 13.35m high, the Great Buddha of Kamakura is Japan’s second tallest bronze Buddha statue and weighs approximately 93 tonnes. Surpassed only by the statue in Todaiji Temple in Nara, the Great Buddha of Kamakura was originally situated within a large temple hall. However, the Buddha has been standing in the open air since 1495 after temple buildings were damaged and destroyed multiple times by tidal waves and typhoons in both the 14th and 15th centuries. Despite its solid-looking appearance, the Buddha is actually hollow and visitors are welcome to view the interior. There was a time when the base of the statue featured 32 bronze lotus petals, however only four of these petals remain and due to their rarity they are no longer on display. Although a popular tourist attraction, the entrance to the grounds bears a notice reminding visitors that this is a place of reverence. Not that you need reminding, the monolithic Buddha presiding over the grounds brings a distinctive sense of peace and comfort to all who visit. 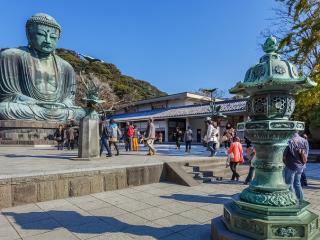 The Great Buddha of Kamakura is located just a 5-10 minute walk from Hase Station. The third station from Kamakura on the Enoden rail line, the Buddha is approximately one hour from Yokohama by train. The small town vibe of Hase and the narrow streets that lead from the station to the Buddha are a treasure trove of souvenir shops, traditional eateries and fresh local produce well worth taking the time to explore along the way.